Play-Based Classroom: Bubbles, bubbles, everywhere! I am in the habit of recycling. 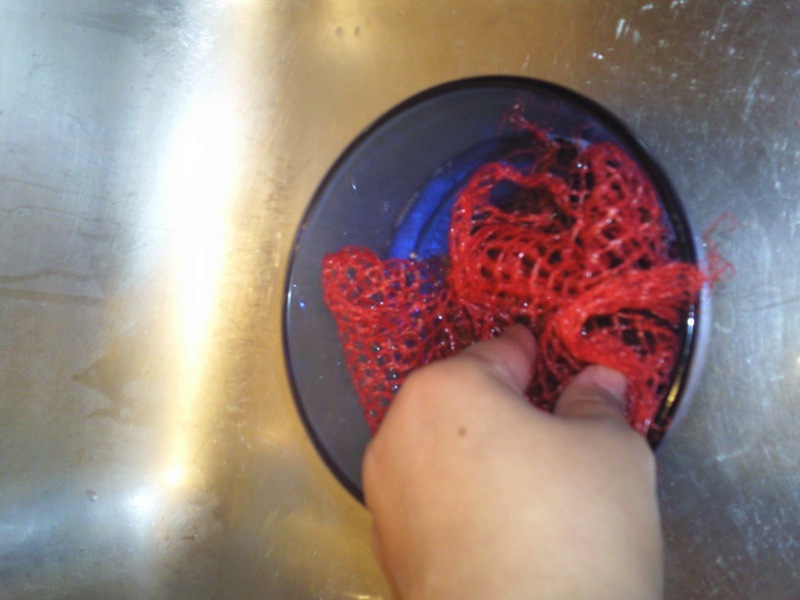 Since becoming a teacher, things that were once "garbage" became castles, things to paint, painting tools, collage materials, sorting objects, play dough instruments, and sand/water accessories. 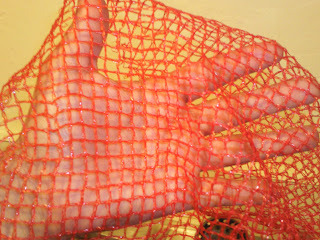 Last night, as I put my groceries away, I stared at the red netting bag that comes with those mini mandarins. My husband asked me what I was doing, to which I replied, "Do you think I could reuse this in my classroom?" "No," he said, and went back to watching T.V. I am not that easily deterred. I just KNEW I could figure out some sort of use for it, so I poured some Dawn dish soap in a bowl, added a little water, and dipped the netting in the bubble solution. I blew into it, and VOILA! Dozens of bubbles! I felt my inner child come out as I started laughing excitedly. "LOOK! I MADE BUBBLES! COME SEE!" My husband just rolled his eyes. Doesn't he see? Doesn't he get it? 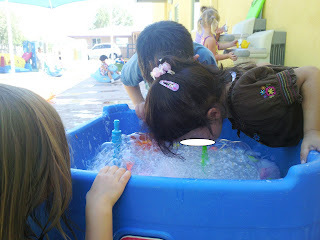 Do you remember the first time you successfully blew your OWN bubble? Most of these children never had the chance. Their teachers blew the bubbles for them. They used bubble machines. The biggest and fastest children laughed and chased the bubbles; meanwhile the smaller, quieter children watched miserably by the wayside. 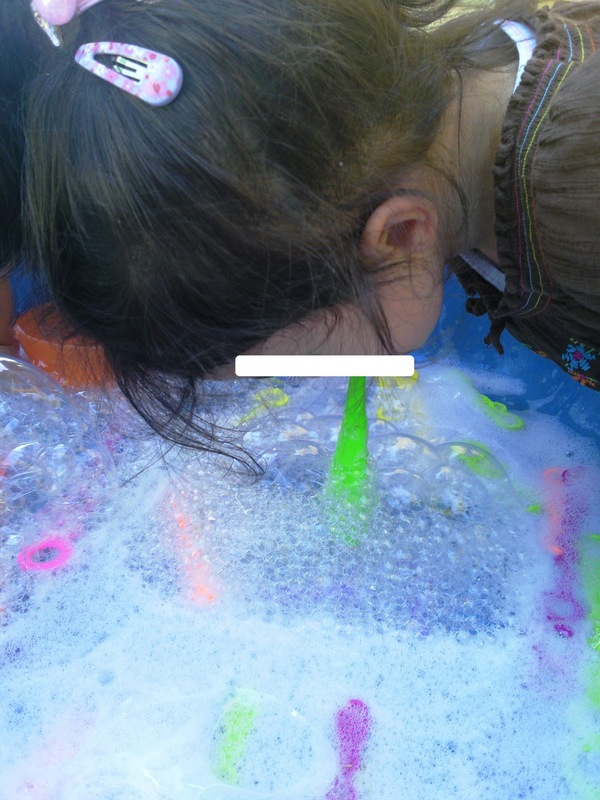 Imagine their surprise when bubbles filled the sensory table? Check out their excitement! 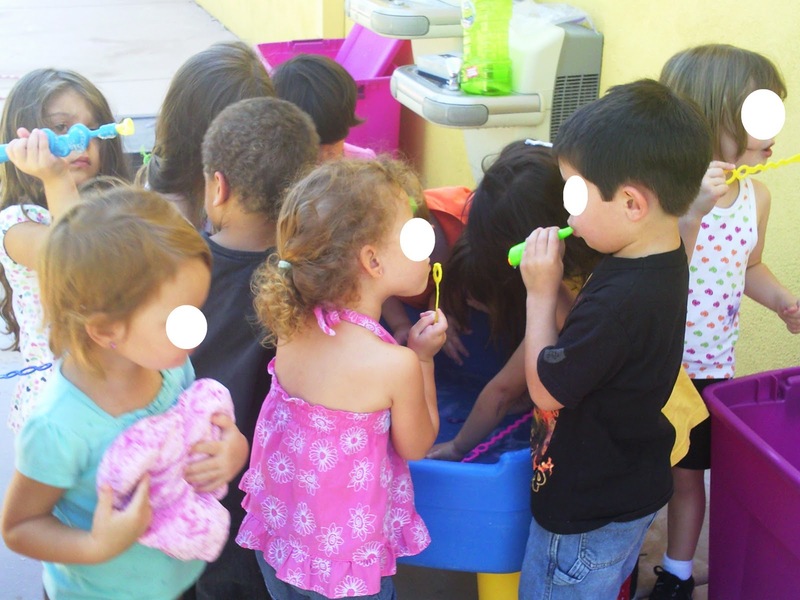 The group congregates around the bubble table, which is filled with bubble solution, at least 50 bubble wands, and six-pack plastic rings. Inquiry in process. 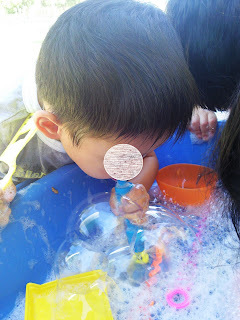 The children experiment with different ways to blow with their mouth to make that oh-so-satisfying bubble! Brandon figures out an easier way to make bubbles! Do you think he's blowing slowly or quickly? How do you know? The other children follow suit. "I did it! 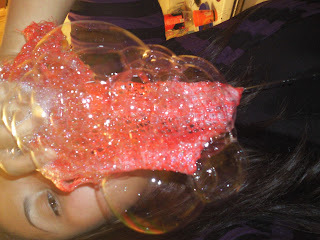 I blow bubbles!" For Beyza, whose first language is Turkish, this is a wonderful opportunity to expand her vocabulary! 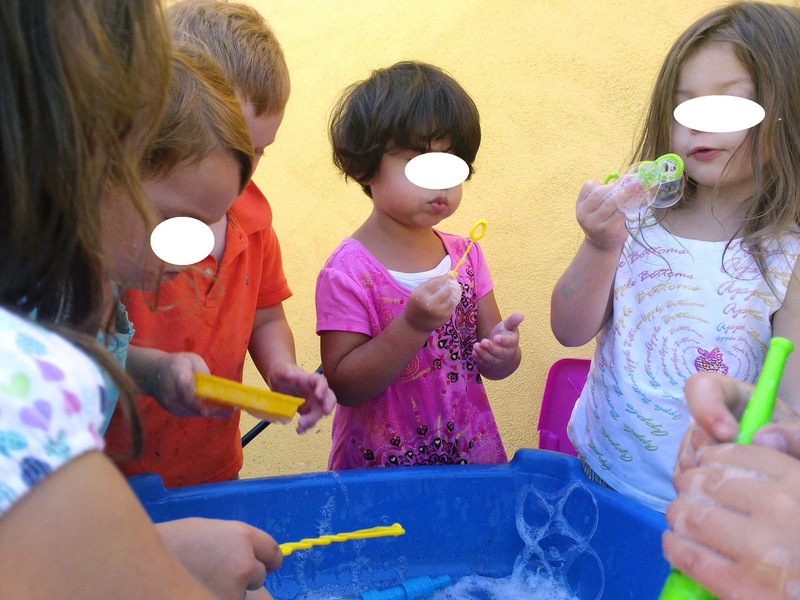 Allowing children to blow their own bubbles offers a multitude of learning opportunities. 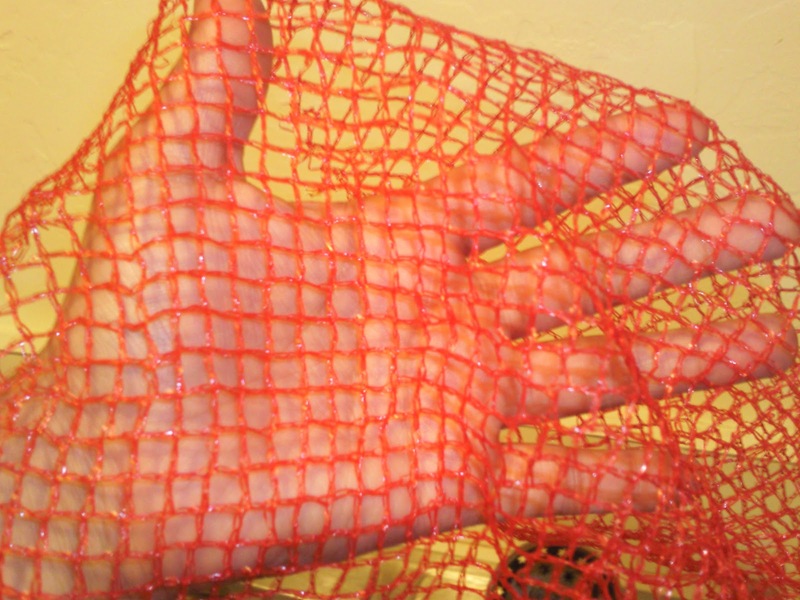 It gives a concrete foundation on scientific concepts such as "air," "surface tension," and "density." 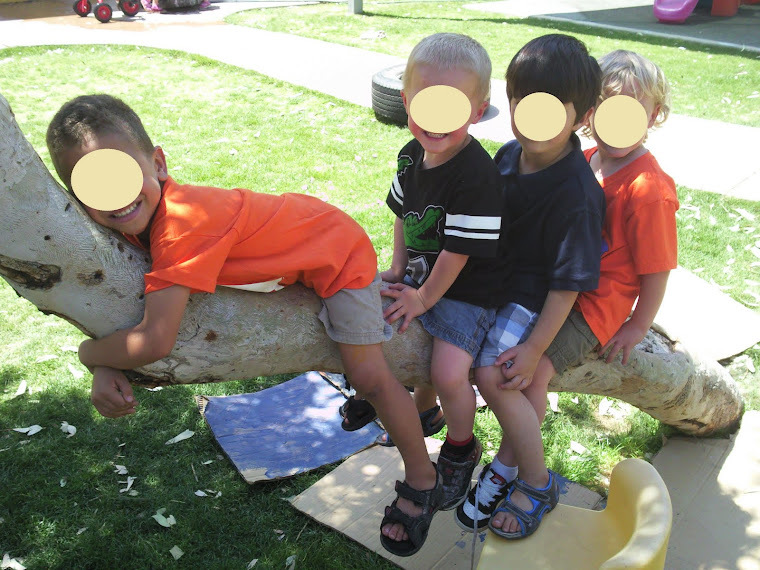 It allows for that ever-so-important process of INQUIRY, in which the children pose a question, and test many ways of finding a solution. Imagine the possibilities for scientific inquiry with bubbles! What would happen if you add more water to the solution? What would happen if you added corn syrup? How could you blow a gigantic bubble? 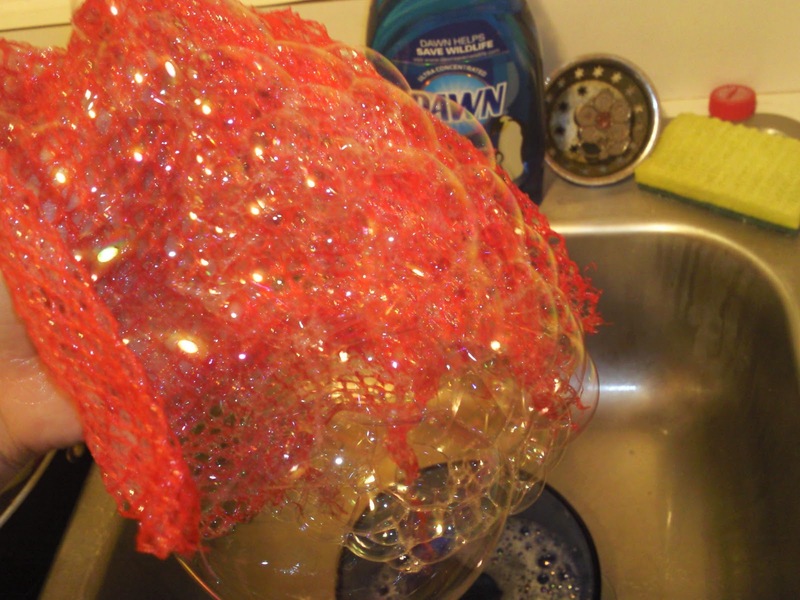 How could you blow a lot of really small bubbles? Am I making my point? 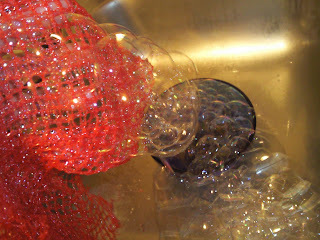 Bubbles are a blast! Thanks for the great ideas!